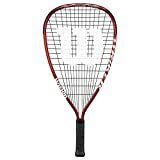 Providing a massive power boost to your strokes, the Wilson Striker racquetball racket is an entry-level option for beginner players allowing for comfortable play and enhanced shot due to V-Matrix Cross Section technology. Furthermore, a fair-sized head of 107in2 (690.3cm2) ensures a larger sweet spot for more accuracy, whilst the aluminium alloy structure of the frame provides a lighter feel and good resilience. There is also Exact Tack adhesive grip delivering brilliant handling, plus overall the racquet grants maximum confidence during difficult matches with stable and responsive feel on every swing.